Consumer communication is changing dramatically, in part due to the broad variety of channels now available and increasing expectations for customer care interactions. This is pushing companies to better understand the customer journey, find missed opportunities for engagement, and create a unified strategy for communication across channels. There is an opportunity for greater personalization of communication with customers by understanding demographic differences in preferences. These have a direct impact on stakeholders across many parts of organizations today, not just the customer support or marketing departments. 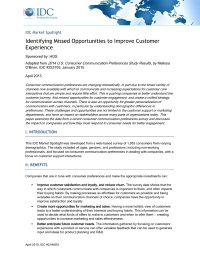 Download this paper as it examines the data from a recent consumer communication preferences survey and discusses the impact on companies and how they must respond to consumer needs for better engagement.